How can I help? Stories and Reflections on Service” Is the title of a book by Ram Dass written about the helping professions. I was first introduced to this book in massage school in 1987 and read it through briefly and didn’t really think much of it. It is now the center of what is really some of the core issues in the massage profession and is the most tattered book on my shelf. The main theory of the book is that there is a deeper reason as to why people help or feel a need to help. We need to boost our self esteem, we need approval and appreciation, we need to feel needed. But helping for the purpose of getting our needs met often leads to burnout and in the massage profession – a failing practice. Because we work in a profession that works very closely with people, it is important to begin to always be working on ourselves to become more aware of our issues and blindspots. “Can we see that to be of most service to others we must face our own doubts, needs, and resistances? What do you get out of helping? What purpose does it serve for you? When you can begin to unlock the deeper meaning of ‘helping’ you can begin to uncover the unconscious beliefs that are usually the cause of our need to help others. 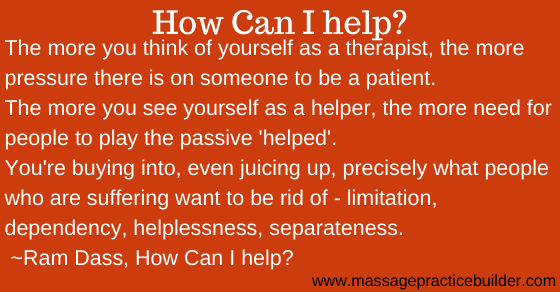 When we come from a place of ‘needing’ to help others it gets in the way of the therapeutic relationship. It starts to become a massage session that is all about us and not the client. We are less likely to be able to really listen to a clients needs and concerns. 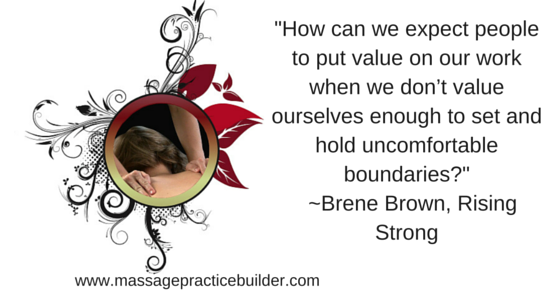 We are more likely to bend our boundaries to accommodate clients thinking we are giving when in reality it is about much more than that. We give so we can get. We give up ourselves so that clients will stay clients because we fear not being able to make a living. We don’t have cancellation policies that support us – we let clients come and go as they please while our income suffers. When we work to become more aware of our own issues and work through them with a counselor or in peer supervision/supervision our work changes. We get caught up in doing for others thinking it is what they need. We get caught up in giving advice or sermons thinking it is for their own good. When people don’t get better, we say we did all we could do and told them everything we knew. We forget to really listen and witness the process of healing. We get caught up in thinking that all of our training, all of the extra hours of learning new techniques, all that you know is what makes you a ‘good helper’. When you help from a place like this it becomes an addiction – like eating candy or drinking alcohol. You get your high from helping and like to think you are being useful. But when does that ‘helping’ begin to hurt more than it helps? The more you can look at this act of helping and all of the needs and feelings associated with it, the easier it will be to fill your practice with the kind of clients who are nurturing and respectful of you and value your time and efforts to pay you what you are worth. Questionnaire to further explore helping issues in the massage profession. 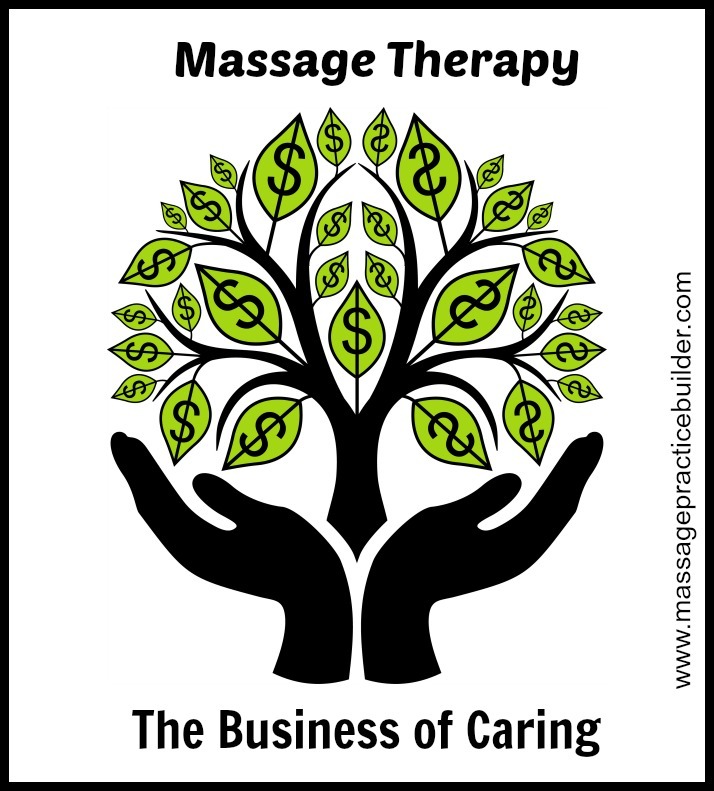 One common theme I see in the massage profession is that many massage therapists think it is much better to care and charge less or not promote themselves enough so they have enough clients than to make money. Yup…me too. Been there, done that and still struggle with issues around making money myself. Who doesn’t? Money is the one thing that touches everyone’s life in some way, shape or form. Money is where we project all of our issues about self worth, being worthy and being good enough. When it comes down to basics – money really doesn’t mean anything. It is a math problem of life to be figured out so you can eat, drink and be merry and pay the bills, take vacations and yes – even continue to stay in business and do more great massage! Maybe even retire one day! Often when people say it isn’t about the money, what they are saying is that they are not making enough doing this work. It is when people think that by choosing to be a massage therapist makes them more ‘noble’ and that money is somehow evil. It really comes from whatever beliefs you developed about your own self worth and money in your early childhood. It is almost like you choose a profession where you can’t make as much money as you need so that you can be more ‘Noble’ than others it keeps you from making more money – a vicious circle of pain, underearning and life draining work. But the reality is you can make as much or as little as you want in this profession – just like any other career choice really. You can make money and still care! A good place to start understanding your underearning issues or at least start becoming aware of them is by looking at what you think about people who do have money. What do you think about people who are millionaires or have more money then they really need? Do you think things like ‘ they must have had to sell their soul to get that money? or that people with money are somehow evil? What do you think when you see people driving a Bentley? I had a client who owed one for a few years but he sold it because he said people kept keying the car – dragging their key down the side of his car for no reason other than he owned a fancy expensive car that most people can only look at in magazines. When you don’t make as much money as you need, you really are not doing anyone any ‘good’. If you are not able to stay in business because you don’t market yourself enough or you are not willing to learn how or to pay someone to market your business – what ‘good’ is that? I do know that part of the issue is that many people come into the massage profession just seeing dollar signs – I can make $65-$100 an hour???? Well you can’t. That is what you can charge for a massage but you usually don’t make that much. They somehow forget to tell you that you will have business expenses to pay as well as you have to get clients on the massage table which means you have to promote yourself to make that happen. The schools often will not tell you that jobs in massage start at $12-$15 an hour which is hardly a living since full time work in massage is usually about 25 hours a week because of the physical demands. Massage therapists cringe at the entry level pay in franchises like that and the low fees that they charge clients saying that it ‘devalues’ the profession. It does I guess in a way do that but it really is just business basics. The owners of most franchises are not massage therapists so they DO care about making money and it is their main focus! They do like salaries of $100k or more and want to be able to sell the business for more than what they paid which is usually $150K-$300K or more! How do you think they will make that kind of money? By paying the therapists less and giving themselves more! They took the financial risk and are responsible for getting clients in the door and they need to get as many as they can. It is just business. It isn’t anything personal. But stop taking the low paying jobs if you can’t make a living at that rate! Take the job if it is a nice supplement to your other income or family! Most massage therapists start their own business which makes them responsible for getting clients in the door. It takes promoting yourself – telling people that you are out there! Some people will call it sales but I just think of sales as high pressure tactics to get people on the massage table and coming back. I won’t go that far really because high pressure sales tactics aren’t really need in my opinion. You do need to ask though! You need to ask people to refer to you. You need to ask the people who come in to refer to you as you are building your business. You have to ask them when do they want to come back…You just have to tell them and ask! It is just marketing! Sounds simple right? Then why are so many massage therapists struggling? Is it this idea that it is somehow better to not have clients and live without because doing massage is so absolutely fabulous and amazing that it will surely get you to heaven because you are so good to be doing this work! What you charge for is your time – Your time away from your family and your life. You charge for your experience and your skills. The Caring is Free! 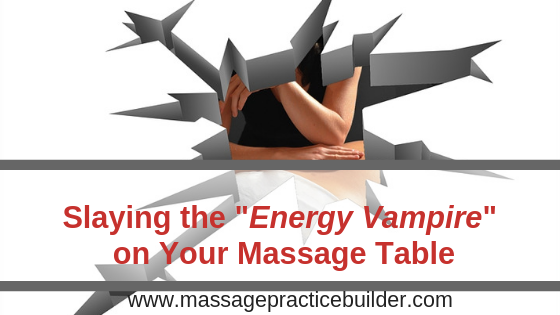 Massage therapists have to remember that it is a business that they are running. To stay in business you need enough money to pay the rent and make a living. You don’t have to be a business major to run a business. You do have to show up and work to get clients. To make it a business you need to have set hours and set days that you work. Your schedule is part of the therapeutic relationship and also part of self care for you. I see so many massage therapists leaning away from same day appointments saying that they aren’t at people’s beck and call and that they have a life. Well it’s fine to have a life, but if you need money and clients, you have to show up on the days/times that you have set up and be there whether you have clients or not. It’s business. Just let people know your hours. Technology is here to help you run a massage business and to manage your time more effectively. The more time you spend working on office work and getting clients scheduled and in the door, the less time you have to give massage where you make the money. Don’t be afraid of technology. Having a really really good website will do most of the work of getting people on the table. It will also be so full of information and content that people will trust you right off the bat when they make the appointment. Online scheduling is a necessity these days. Saves hours of time trying to get people on the phone and get them scheduled. If you really really don’t want to work on your website and get it to the point of doing all of the work for you, then you will have to be an expert at networking and getting people to refer to you. You won’t have to ‘sell’ clients on your services. Selling is really just telling people what you do and what massage can do for THEM. It is a natural process of educating people and giving them the best massage that they ever had in their life. Just be yourself. Share what you know. Learn to write and talk about massage. Be a big fan of massage and get massage weekly yourself. Some massage therapists will say that they don’t like being a sales person. The word sales conjurers up used car salesman trying to sell you a junker car for way too much money. That is not what you need to do! Start with my 5 step process. Why Women Earn Less: How to Make What You’re Really Worth – Mikelann Valterra Getting to the core of your beliefs about money takes some work to examine your own beliefs and issues around money. It is such an unconscious process! Financial Recovery: Developing a Healthy Relationship with Money – Karen McCall (Mikelann’s Mentor!) The Plan for recovery is in tracking your income/expenses and getting to the point of knowing that it is all just a math problem. Massage Cancellation and no show policies are perhaps the most important part of your massage business framework. Your business framework is what supports you in the process of doing business. These policies also bring up strong emotions and challenges in doing so. These policies can have an effect on your bottom line – as in if 1 person no showed every week that would be thousands of dollars of lost income a year. Your policies will affect the whole profession. In essence you are teaching people how to treat you and the whole profession. When you are first starting out and have the time available, you might think that is it OK to let people slide. Many also think ‘Oh, that must mean I am supposed to have time for myself”. When you say things like that it may really be telling you that you need some time off yourself. When you sacrifice your time for others and don’t respect your own time, people won’t respect your time or you either. Only you can decide what is right for you. You can set a policy that you can sleep with. It will change over time as you get busier and also as you begin to understand the value of your time. But I challenge you to take some time to really think about your cancellation and no show policies carefully. The more you respect your time and teach people to respect your time, the better your chances of success. Letting people go without paying or any penalty is telling them that your time is not important. It is telling them that your work is not important. If you are just starting out and don’t charge people anything at all just start thinking about how much you will lose in the long run. If you plan on being in business 10, 15 or even 20 years that can add up. If you had 4 cancellations a week for a year and charged $60 an hour that would be almost $15,000 a year. Can you afford to lose that? It can take its toll on your business. Every time you get clearer around this boundary I believe you will see a change in your clients and in yourself. Setting a fee for cancellations and no shows tells yourself that you respect your own time. I see it as one of the highest forms of self care. Massage therapists in general have a hard time charging for their time and services thinking that it is better to live without. This idea of Noble Poverty has it’s roots in the way you were brought up. Taking a look at your issues around money can help you to understand that money is just a math problem. Learning to take the emotions out of money is an ongoing process since they are so ingrained in people. Many will also use the standard claim – “Doing Massage isn’t about the money!” Well I am here to tell you that it is and if you are saying it chances are you don’t have much money or don’t have what you need. People will think that if they say it is about the money they are less giving or less caring. You aren’t being paid to care. You are being paid for your time – for your time you have to take away from your family or other things that you love. And yes massage is one of those things that I am sure that you love but you only have so many hours in a day/week/year. Your body will not hold up as long in this career. Your time is usually limited to 25-30 of hands on time or even less. You need money to pay the bills, save for retirement, pay for kid’s college, take nice vacations to rest – you deserve it all and that all takes money. Your late arrival will require that I end the session at the scheduled time, meaning your session will unfortunately be shorter today. I have reserved this time for you and only you and have other people scheduled after your time. When clients arrive late, it can cause a real problem. If you extend your session to go the full time, you may make the rest of your appointments late which won’t make anyone happy. If you cut their time short and end at the scheduled time, you will need to explain your policies so that people will not be mad. A mad client these days can lead to worse things like bad Yelp.com reviews and further problems. You can take it on a case by case basis. Sometimes you might not have a client right after or you may have breaks scheduled in between clients so that you can adapt for late arrivals. If your schedule allows and you are trying to build a practice, working a little longer to the full time might help create a better relationship and a repeat client and all of the possible referrals they will potentially send your way. (Remember a referral network is “Your people have people who have people”). This is a basic boundary issue. The thing with boundaries is that they will let you know what is going on by how you feel. If you give them more time when you don’t have time or if you feel resentful that they are late and you think they are trying to take advantage of you, there are usually other things going on. You may be needing more self care time to nurture yourself and get more Me time. The top of the line no show policy is of course you miss the appointment, you pay for the Whole appointment! Yes that means everything! That is always easier said than done. Making people pay for something that they did not receive can be challenging especially since they didn’t show up to charge them. You can send them a bill or add it to their next appointment but the thing is that many will not come back in if they are made to pay. The first thing is always to make sure they know the policy. Regular clients and clients who value your time and massage work, will respect your policies and understand. They will usually come with their no show payment in hand for the next appointment. But how do you get people to that point of respecting you and actually paying. Massage therapists are also hesitant to make people pay for a missed appointment. Sometimes it means you start with where you are. Try setting a now show fee like $25 or $35 or a portion of the full fee. You may want to do that when starting out and training your clients. As you get busier, it will be even more important to enforce because you will have people who are waiting to get in and you will be losing more money. It is often a process of building up your self confidence and getting over your fear of rejection. As you get more experience you will usually find that most are really willing to pay. Those who don’t want to pay, just don’t understand and may not value your time. You have to let them know what your policy is though in the first place. Clients are not mind readers. They often just don’t know. They might also have had other therapists who will let that slide because they are building their business or they don’t enforce those policies. You can’t enforce what they don’t know! It is usually in the they don’t know that they will be upset and mad! The biggest mistake I see massage therapists making is that clients don’t know the policy in the first place and because everyone seems to have different policies you just have to clearly tell them so they understand yours. Put your policies on your website. Have people sign a copy of your policy when they come in. When new clients call to schedule an appointment, consider taking a credit card to secure their time and tell them of your policy right up front. Tell them that you are reserving that time for them and them alone so that you will not take another client in that spot. Some online scheduling systems will allow you to take credit cards to secure the appointment. It things still go wrong and the client does not understand why they must pay or when they must pay, they might not be a good fit for your business. Building your confidence in creating your policies and working to enforce them is best done with a support system in place. Supervision can provide that exact place where you can present your policies and learn more about what it is that you really want while you build your confidence in creating and enforcing your policies. Having a support system can can help you to create your policies and step by step learn to enforce them. Share your no show and/or cancellation policy in the comments!